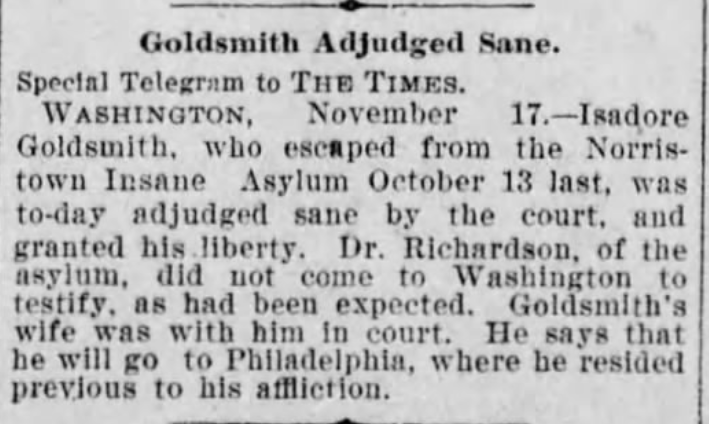 As I wrote in my last post, Isadore Goldsmith seemed to begin having legal and medical problems in January, 1893, after allegedly being assaulted in Philadelphia and then trephined in the hospital as part of the treatment for his injuries. He then was arrested for drunkenness but released when the court concluded he was epileptic, not drunk. But his troubles continued, as detailed in my last post: suicide attempts, some bizarre behavior, and more encounters with the police. 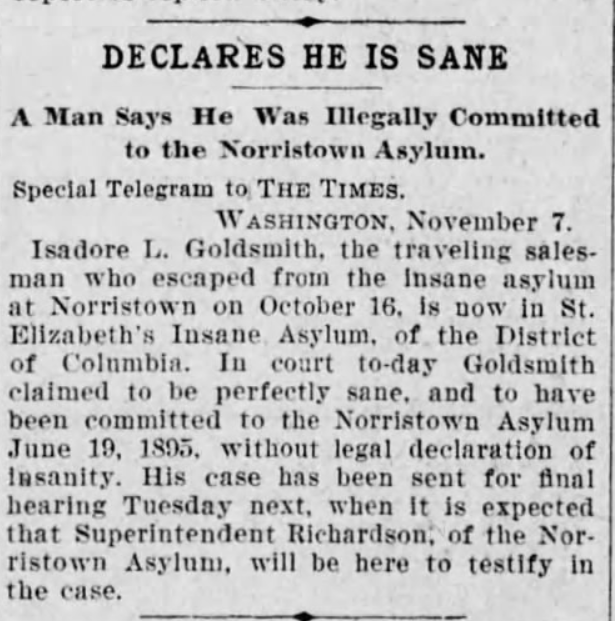 “Declares He Is Sane,” The Philadelphia Times, November 8, 1896, p. 1. The somewhat unusual spectacle of a man marrying the same woman twice was witnessed in this city today [Washington, DC]. The two-time bridegroom in the case is Isadore Goldsmith, a young Philadelphian. His story is a romantic one. Goldsmith was an inmate at the Norristown Insane Asylum, from which institution he escaped on October 13. He went quietly to Camden, where he was married to Mary B. Wheeler on the day after his escape. The couple came to this city, where he was arrested as [?]. Goldsmith appealed to the courts for a writ of habeas corpus, claiming that he was perfectly sane and had been unjustly incarcerated. The case came up before Judge Hagner on Tuesday. 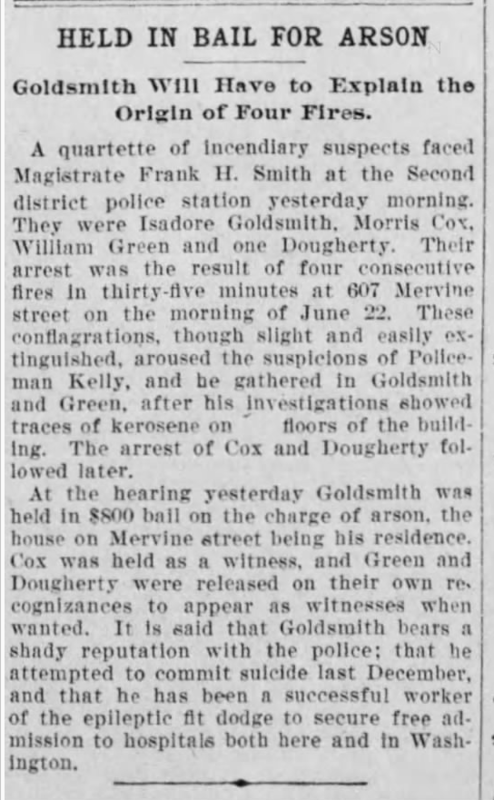 Goldsmith was the most important witness in his own behalf. He was entirely rational and made a good impression. Some hard questions were put to him, but his answers revealed a clear memory and connected reasoning. While at a hospital in Philadelphia last summer he was informed by Dr. Hughes, the physician, that a relative wanted him sent to the Norristown Insane Asylum. He was in the Philadelphia Hospital because he had feared one of his attacks was coming on; but he left when he heard of this intention. He was afterwards arrested and incarcerated at Norristown until his escape. To-day Mr. Goldsmith and his wife were re-married by a local clergyman. This second marriage ceremony was performed because Mr. Goldsmith feared that it might be claimed that his first marriage took place while he was legally an insane person. The newspaper considered his story to be “a romantic one.” But there is no explanation of how he met Mary or anything about her or their relationship. And who was the relative who had had Isadore committed the prior June? In the 1898 Philadelphia directory there is a listing for Isidore Goldsmith, a repairer. I think this might be my Isadore because on Mary’s death certificate, her occupation is listed as china repairer, so perhaps they were working together. It is said that Goldsmith bears a shady reputation with the police; that he attempted to commit suicide last December, and that he has been a successful worker of the epileptic fit dodge to secure free admission to hospitals both here and in Washington. A pony ridden by James Irwin this afternoon was driven into the surf in pursuit of Isadore Goldsmith, a middle-aged Philadelphian, who was fully clothed and apparently bent on drowning himself. Hundreds on the boardwalk and Young’s Pier where the man had waded into the breakers, wild with excitement, shouted to “save him,” but no one cared to face the heavy sea, and the life guards had retired from duty today. The pony balked, but spurs urged him into the sea. Reaching Goldsmith, Irwin caught him by the coat collar and was dragging the man ashore, when Goldsmith fought to free himself. During the battle between the two, Irwin, a slim young man, was nearly dragged from the saddle, but he held grimly to Goldsmith with one hand and to the pommel in the saddle with the other. Both were swept time and again by the heavy seas. Those watching the battle feared that both would be drowned until the pony had backed them into comparatively shallow water, when several men went to the rescue of Irwin and the desperate man he had pulled from certain death. Goldsmith was sent to the police station, and he was found to be in no condition to give an explanation of his conduct. Cheers greeted Irwin when he brought Goldsmith to the beach, and some rushed to him to shake his hand, hailing him as a hero. This attempt I find particularly troubling as it endangered another person as well as an innocent animal. 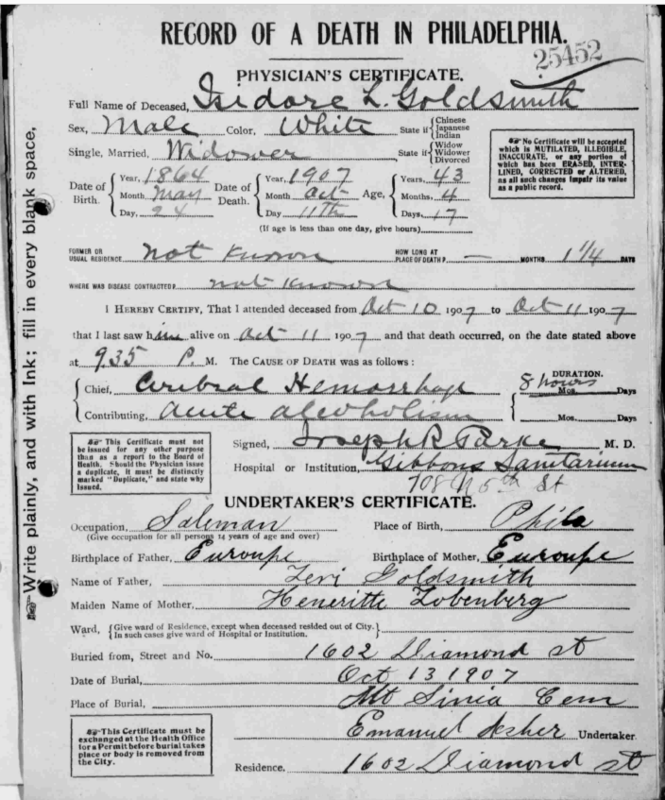 Six months after this episode, Isadore’s wife Mary died on April 19, 1907, from a stroke, and then six months after that, Isadore finally found the peace he must have been seeking—he died on October 11, 1907, from a cerebral hemorrhage and acute alcoholism. The last news item I found for him was this brief death notice in the Philadelphia Inquirer. I guess his death did not merit the front page despite the fact that the struggles he had endured were often considered front page news. The Philadelphia Inquirer, October 12, 1907, p. 9. Was the cerebral hemorrhage related to his injuries from 1893? Was he really an alcoholic or was he an epileptic or both? His several attempts at suicide and his ongoing hospitalizations suggest a man with severe mental health issues. Isadore was clearly a man with many problems—whether those problems started with the alleged assault in January 1893 or whether they started years before when he was a young man, I don’t know. In the end, it doesn’t really matter. All we can say is that this was a man who had a very troubled life. And his troubles somehow managed again and again to be considered front page news in Philadelphia. 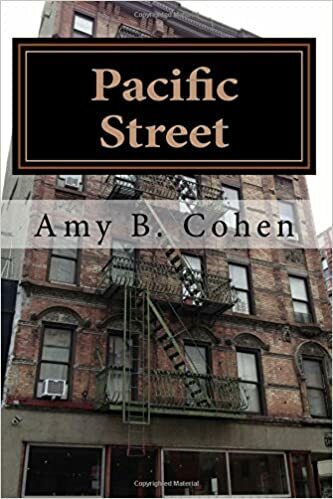 This entry was posted in Genealogy, Goldschmidt/Goldsmith, Philadelphia and tagged Goldsmith, mental illness, Philadelphia, suicide by Amy. Bookmark the permalink. Such a sad story. Sadly the problems these days with mental health – even with the amount of awareness and charities etc out there to help people, I wonder if how he suffered would be any different today? I’d like to hope that he would have had more support these days. So would I, Alex. We have come a long way and certainly understand epilepsy better, but we still have a long way to go in understanding mental illness. Wow! Wow again! My heart and thoughts wander to Mary and what she must have endured as his wife…your so right, no matter what the cause, it was a troubled and very sad life. Remind me Amy, were there any children? No, there were no children. I wish I knew more about Mary. How did he meet her? She must have seen something in him that others did not. So very sad indeed…a difficult life for a man who sounded like he was just trying to find his place in the world…I hope he and Mary found at least some happiness together. As suspected on your previous post, Amy, Isadore suffered from mental illness. As it is often the case with people who suffer from this terrible disease, Isadore had his moments of mental clarity and thus was able to fool the medical authorities to declare him sane. A sad sad story, which in spite of our advances happens too often in our streets, where the homeless suffer from mental illness and do not receive proper treatment. It is so true. We have come a long way, but we have a long way to go. We just need to walk in that other person’s shoes a bit. Wow. What a troubled life. I am very curious about which of his family members sought the earlier commitment. I am going to guess his brother George. His parents were both gone, and George was the only brother still in Philadelphia in 1896. I doubt it was a sister back then, so George would be my guess. Then as now, some journalists and some newspapers (but not all), go after the sensational just to drive up sales. Same as today. I agree with you that Isidore had many mental and emotional issues prior to the attack. But I do think his later problems were aggravated by the very primitive medical treatments of the time. I agree—I think it was a combination of a number of problems that haunted him including poor medical care. I’m speechless. I’d like to meet this Mary Wheeler, too . . . . I’d guess that he had a severe mental illness and was getting no help at all for it. It was the dark ages for those with mental illness. And epilepsy. Rough, rough life! It’s so hard to diagnose mental/emotional/personality disorder issues. Very sad. It really is. The more I think about it, the sadder it seems. A sad story which needed to be told. Without the newspaper coverage, you may have had to do a lot of deeper digging to learn more about his illness. Don’t you think it’s the hard stories like this which make us better researchers? I am not sure what I would do without those newspaper databases. They are the key to opening my eyes to the people behind the dates and names. What a sad life – so much happened in 43 short years. I’m glad he finally found peace.